Reduction of US$ money supply by the Fed reducing their balance sheet. The USA lead front and centre by the Trump government instigating the rapid expansion of deficit spending at the same time as the USA Federal Reserve is raising interest rates and shrinking its balance sheet by $50bn a month. This has drained significantly more US$ liquidity from global financial markets and hence tightened rates even further, was this more than they intended! Some of the examples of this lack of liquidity has been the late 2018 global equities capitulation and the increase in extreme volatility in most markets. 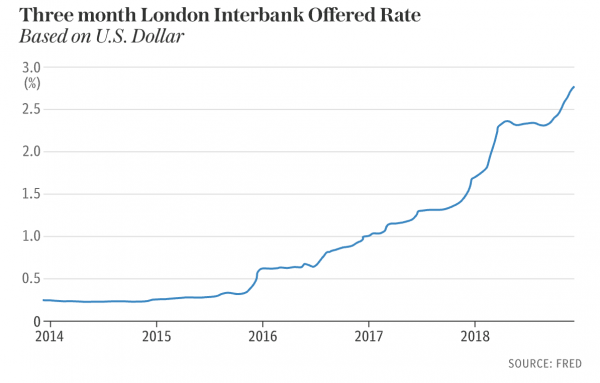 The three-month US LIBOR rates has doubled to 2.78pc over the last year alone, and a stunning 550% rise since 2015. The impact of higher US$ interest rates is significant both domestically in the US, but more so internationally as offshore global debt denominated in US$ has ballooned since the crisis of 2008. Emerging markets and Europe are being squeezed by the strong US dollar and Fed rate rises, the 12.8 Trillion US$ (BIS updates) off-shore debt carry-trade is unwinding. Carry-trades develop when borrowers across the world succumb to credit booms and borrow in a liquid low interest-based currency (the US$ since 2008) and convert to their domestic currency for use and investment. Carry trades do have inherent risk and often spiral into calamity when confidence evaporates, capital flows dry up in the borrowing currency as rates rise. Beware as the interest rates in the US continue to rise the borrower (most likely a country) will then have trouble repaying the interest in their debt. This causes a huge unwinding of the carry trade and hundreds of billions of dollars can very quickly flow out of a borrowing country, especially when that country has a balance of payment deficit. Europe and Emerging markets being at the epi-centre of the impending global debt crisis? Europe is facing recession after almost 10 years of little or no economic growth, Italy is the worst of the lot at the moment, but Germany and France (who are at the economic heart of Europe) are facing recession and a banking crisis, while France’s budget deficit could very well blow far past Italy’s proposed fiscal deficit. “It is quite obvious that the budget deficit will be at least 3.5pc of GDP next year, and probably 4pc because the economy is heading for a light recession,” said Professor Jacques Sapir from the École des Hautes Études en Sciences Sociales in Paris. The economic numbers out of Germany are shocking. For 8 out of 12 months, German production has declined. On average, manufacturing declined 4.1% in November 2018 and energy production has declined 3.1%. Even construction has declined 1.7%. Debt-to-GDP ratios in a string of very vulnerable countries within Europe are far closer to the danger line now they were at the onset of the global financial crisis a decade ago – up from 68pc to 125pc in Portugal, 36pc to 98pc in Spain, 99pc to 131pc in Italy, 65pc to 99pc in France, 54pc to 96pc in Cyprus, and 103pc to 176pc in Greece (despite debt forgiveness). The European Central Bank might have made a serious mistake by shutting down quantitative easing into the teeth of a worldwide cyclical slowdown. 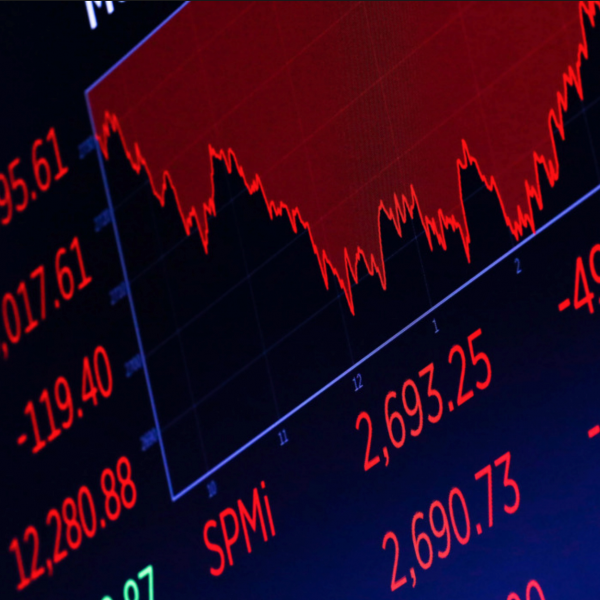 Surging borrowing costs for companies in the United States Dollars in Europe threaten a potential recession within months and resemble events leading up to the global credit ‘heart attack’ in August 2007. Social unrest historically has been driven by underling currents of severe economic strain and political incompetence. Nowhere is this more evident than Europe at the moment with riots, social unrest, surging right wing and third-party ‘populist’ support, discontent over the economic situation and its stagnating economies burdened with unprecedented debt loads, the “yellow jacket” movement in France is a great example of the European public’s dissatisfaction. Nomura the Japanese bank has warned in its 2019 outlook that China is leading much of east Asia into a severe ‘credit crunch’ as global liquidity drains away, with property slumps and outright deflation to be expected over the next few months and years. The China official PMI survey for December slumped below the boom-bust line to 49.4. New export orders slid to crisis levels of 46.6, which was last seen in the depths of the Chinese currency scare of 2015. This has been exacerbated by the trade war between China and the USA. This is all but fully understood by the ‘global macro’ hedge funds and money managers, but not yet understood by the broader general public general public and invariably news outlets who always arrive late to a trend change, or indeed all too often by the policy making classes in the West who still rely on old ‘pre-China’ notions of how the world works. Asset bubbles driven by a tsunami of credit and leverage are beginning to burst. A “fascinating statistic” by Deutsche Bank has been published recently, as of the end of year 2018 a whopping 93% of a far-reaching basket of assets had a negative total return year to date 2018 in US dollar terms. This was the highest percentage on record based on data going all the way back to the year 1901, eclipsing the 84% hit in 1920. Putting this in context, in 2017 just 1% of asset classes delivered negative returns. What a change a year makes!!!! The ‘global debt crisis’ is now very much biting hard into the world economy, as the ‘Great Monetary Inflation Experiment of 2011-18’ enters its late cycle hazardous phase where the economic potency of new debt has collapsed by over three quarters since the early boom years of the early 2000s. The balance of risk and reward has turned plainly negative. 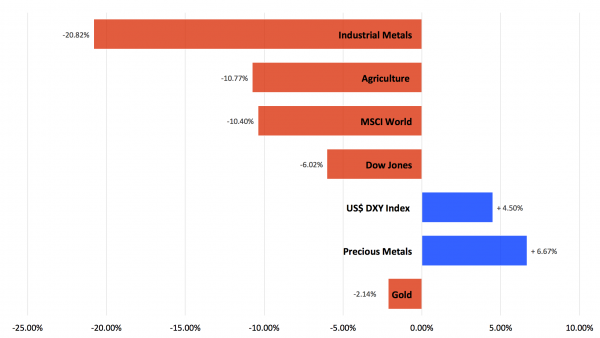 As you can see in the charts below, the dramatic falls in the major asset classes alongside falling global property markets, the asset classes that have shown any growth have been the US$ and Precious Metals (a category including gold, silver, platinum, palladium and rhodium). Property markets are falling hard or breaking lower, the last of the global property bubbles are bursting one by one, from Sydney to Melbourne, Shanghai onto Beijing, Hong Kong, Singapore, London to USA and Canada. The great debt leverage bubble and extreme monetary inflation of the last 7 years had pushed these markets to valuation extremes versus average income that was never thought humanely possible in more sober times. As the credit and cash liquidity expansion ‘tsunami’ unleashed by monetary authorities globally since late 2008 now pulls back from shore, it simply exposes a naked banking sector that has serious balance sheet problems alongside domestic debt leverage that is increasingly difficult to fund even at globally low interest rates. What to Expect in 2019 ? Forecasting markets at present within strictly the short to medium term is fraught with danger due to the extremes at which governments and central banks are willing to go too, “extend and pretend”. However saying that, mathematics has now overtaken us all, debt dynamics is now the tail that wags the dog. Long-term repercussions are now becoming clearly focussed with deteriorating global indicators and overarching debt dynamics. Steen Jakobsen (Saxo Bank) has succinctly framed what we are facing globally and we could not have put it better ourselves, he is betting on a “global policy panic” and another round of massive money printing and debt creation from central banks and governments. “The mood in Europe, Middle East, Africa and Asia is the worst I have seen – including the conditions leading into 2008. There is a new sense of urgency everywhere,” he said. “Europe is sliding back into recession despite a negative ECB policy rate. Germany and its marquee names suddenly look a far greater risk than Italy’s populist government. The UK has suffered the biggest credit contraction of any country.” Partially due to a completely mismanaged BREXIT negotiation. We understand where Jeff is coming from as a fund manager with enormous exposure of capital under management, very short-term bonds seems the most obvious route for a man in his position due to the sheer size of that market which can effectively support his funds under management and in crisis short term maturity bonds will outperform. However, bonds are not without risk, even sovereign bonds particularly as the sheer levels of debt issued and continued government deficit spending compound the mathematics of sustainability, governments are at real risk of losing control over their debt markets and the interest rates they effectively yield, exacerbating debt loads. But wealth preservation requires assets with zero 3rd party liability and considered globally as a tier one asset class, also highly liquid. Hence global central banks, wealth managers and high net worth individuals are diversifying into gold and precious metals. In fact gold against a major commodity currency the A$, the metal has just broken to a new all time global high – see below…. But how cheap is gold exactly ? 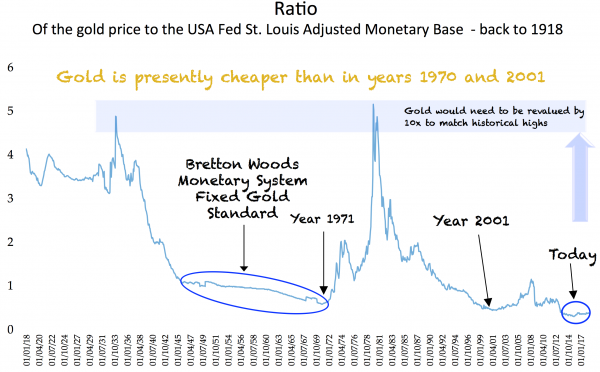 With the enormous expansion of credit and monetary inflation since the global crisis, gold is in fact the cheapest it has ever been historically as measured against currency and debt in circulation …. Has there ever been a more important time in protecting your wealth using a highly liquid tier-one asset? Investing through a well-managed ‘basket’ of precious metals with a team of experts has never been more important in our view. Information contained herein is believed to be reliable, but its accuracy cannot be guaranteed. It is not designed to meet your personal situation – we are not financial advisors, nor do we give personalized advice. The opinions expressed herein are those of the publisher and are subject to change without notice. It does not take into account the particular circumstances, investment objectives and needs for investment of any investor, or purport to be comprehensive or constitute investment advice and should not be relied upon as such. You should consult a financial adviser to help you form your own opinion of the information, and on whether the information is suitable for your individual needs and aims as an investor. You should consult appropriate professional advisers on any legal, taxation and accounting implications before making an investment.